One of Broadleaf’s important clients in the Middle East is the Abu Dhabi Gas Liquefaction Company (ADGAS), part of the Abu Dhabi National Oil Company (ADNOC) group of companies. ADGAS developed an enterprise risk management (ERM) framework to identify and manage uncertainty across the business. Like most companies in the oil and gas sector, ADGAS has well established processes for health, safety and environmental protection – it recently passed 35 million man-hours without a lost time injury, an exceptional outcome – as well as sound methods for managing quality, asset integrity and reliability. ADGAS’s ERM process built on these existing good practices and is linked to the company’s Balanced Score Card. An ERM Policy was endorsed and signed by the then General Manager, Mr Saif Ahmed Al Ghafli, and an ERM Framework and ERM Standards were provided to the management team for review. We began the development of a corporate register of threats and opportunities in June 2008, working with the Business Support Division to obtain inputs from a wide cross-section of managers and drawing on our experience with other operating companies in the ADNOC group. A workshop with the senior management team to consolidate and agree the corporate register was held in August 2008. The following image, a page reproduced from the monthly ADGAS News of September 2008, provides an outline of the workshop. An important contributing factor to the success of the activity was the strong support of the then General Manager, who is seen second from the right in each of the pictures. In October 2008 we worked with managers and senior personnel from ADGAS Divisions and Departments to review the causes and impacts of the corporate threats and opportunities, record the main controls currently in place in the business and identify options for improvement. 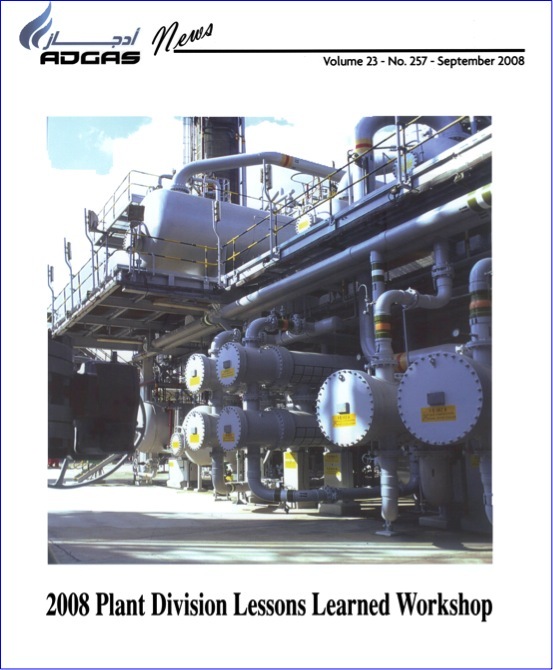 It is worth noting from the cover of ADGAS News shown below that there is a strong ‘lessons learned’ ethos in ADGAS. This is one of the core building blocks of a sound ERM process. As well as facilitating its ERM development, Broadleaf works with the ADGAS Projects Division on risk assessments for large projects, primarily associated with major plant upgrades. These are substantial undertakings that underpin the overall success of the business.